No, tubes will never go away. As we explain in the editorial for this Glass Audio Special edition, it's not just about the popularity of tube audio amplifiers and pre-amplifiers in high-end audio circles or the sheer number of affordable headphone amplifiers featuring tube stages. The whole tube manufacturing industry is being revamped with improved new editions of the classics and new approaches to valve-type devices. It seems, the further we evolve in the digital streaming music age, the more the sound of tubes is appreciated as a critical analog stage. 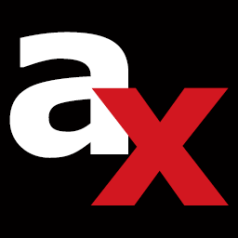 For audioXpress May 2019, we’ve put together a very strong edition, with some of best tube experts sharing a series of DIY projects for all skill levels. 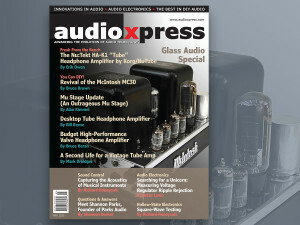 We felt this would be a fitting way for audioXpress to carry on the “Glass Audio” tradition. We start with Bruce Brown, explaining how to restore and revive the famous and much appreciated McIntosh MC30 mono power amplifier. Combining his vast experience in restoration of tube equipment with his appreciation for the famous amplifier produced from 1954 until 1962, Brown focuses on restoring and introducing some improvements to the last remaining MC30 units, which currently sell for hefty prices when in reasonable working condition. In "A Second Life for a Vintage Tube Amplifier," Mark Driedger explains how he revamped his old, and relatively unknown Electra EL-3000 tube integrated amplifier into the 6BM8 amplifier, a contemporary component that would be the envy of any audio enthusiast. The inspiring project shows how to get a high-end result, even from a relatively underrated Japanese amplifier. Next up, Bruce Heran shares how to build a valve headphone amplifier with only six components in the active circuit portion (per channel). As Heran details, the project uses no capacitors, it is easy to configure, sounds very nice, and is the result of simply deciding what a headphone amplifier really needs to do. The result will certainly inspire many DIY enthusiasts and is something to take note. And when audioXpress issued the call for vacuum tube projects for this edition, Bill Reeve decided to share one of his longtime favorite designs - a vacuum-tube based headphone amplifier that could also be used to drive small desktop speakers. Again, a simple but very inspiring project that will please anyone building it or simply enjoying the result. 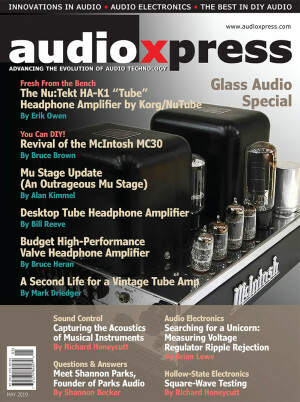 Finally, Alan Kimmel, an esteemed audioXpress author who has built and tested many tube, solid-state, and hybrid circuits over the years, brings us an update of his 1993 Mu Stage design, which appeared in Glass Audio magazine. Kimmel believes the Mu Stage is capable of producing the most constant-current operation as well as very low output impedance and he thinks he found a very worthy update of this circuit. And since this is 2019, we asked Erik Owen to share with us his experience with the new Nu:Tekt HA-K1 “Tube” headphone amplifier using the novel Korg Nutube 6P1 device (read about it here: www.audioxpress.com/article/r-d-stories-the-korg-nutube-6p1). This interesting headphone amplifier is sold as a kit for $199, it's relatively easy to assemble, and - more interestingly - makes for a practical way to actually induce some of the magic of tubes in a relatively portable configuration. 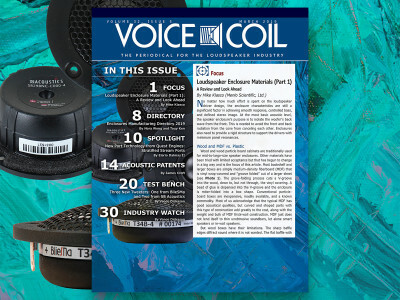 As Owen puts it “a small piece of innovation that I purchased on a whim: a miniaturized vacuum tube amplifier.” In our May edition, he shares everything he learned about this new approach on tubes and how it delivers. In Questions & Answers, we talk to Shannon Parks, the founder of Parks Audio. Many of our readers will recognize him as being the author of the Budgie, an Arduino-based tube stereo preamplifier project, published in audioXpress, July 2014. Since then, Parks has devoted his full attention to his Parks Audio business (parksaudiollc.com), and has crafted some truly fascinating devices like The Puffin, his most recent completely adjustable phono preamp and DSP which is now fostering his business. But there's much more to read in this issue. Richard Honeycutt writes about the techniques for miking instruments, taking into consideration the acoustic environment and the properties of the sound source propagation in those environments. 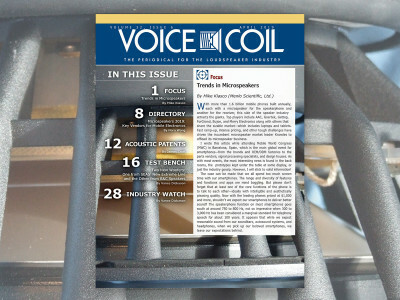 In his Sound Control column, Honeycutt explains how to properly mike an instrument and listen to the instrument before placing the different types of microphones. And our readers who are always looking for inspiring and mind-crunching new concepts in Audio Electronics are also in for a ride. 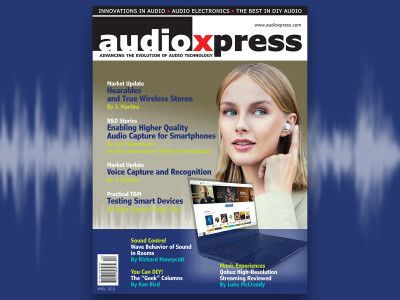 In this May 2019 edition of audioXpress, Brian Lowe starts a fascinating journey in his search for a "Unicorn" that is measuring voltage regulator ripple rejection - or power supply rejection ratio (PSRR). Lowe is the founder and principle engineer at Belleson, LLC, and he has devoted a lot of time to this fascinating "quest." And again focusing on tubes, in his Hollow-State Electronics column, Richard Honeycutt explores the value of square-wave testing and shares what these tests actually reveal. 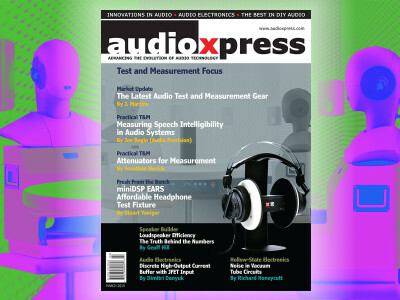 If you wish to buy a single printed issue or the complete audioXpress archive on USB, from 2000 to 2019 (yes, including the latest issue), just visit our online shop at www.cc-webshop.com.